Jasper Tudor must have covered more miles than almost any other protagonist of the Wars of the Roses. From the time he became an adult, until not long before his death, he was constantly on the move. The numbers aginst the places correspond to those on the map here and at the end of this article. Life began quietly enough, at the Palace of Bishops Hatfield (1), a house owned by the Bishop of Ely, located about 30 miles north of London. The house that Jasper was born in was demolished and replaced in the 1480s by Bishop John Morton. The Great Hall of Morton’s house is still standing, but the majority of his palace was replaced in the early 17 th century by the fabulous Hatfield House, built by Sir Robert Cecil, Earl of Salisbury, and still occupied by his descendants. The house and gardens are open to the public and are easily accessible by train from London. Jasper’s mother, Katharine de Valois, died when he was no more than five years old, and he was put in the care of the Abbess of Barking Abbey (2). 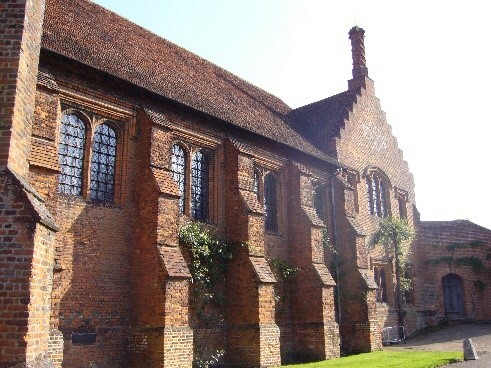 Barking, in Essex, and now in east London, was one of the most important Benedictine convents in England, with the abbess taking precedence over all other abbesses and holding lands of the abbey from the king as a barony. It was one of the wealthiest abbeys and was frequently patronised by royal and noble widows wishing to retire from the world yet live in comfort. It is unlikely that Jasper would have endured any kind of monastic penury – the Abbess, Katherine de la Pole, was the sister of Henry VI’s chief minister, the Earl of Suffolk, and she would have been expected to care for the King’s half-brothers and bring them up as noblemen. In 1443 it seems that the boys left Barking – it would be unsuitable for adolescent males to be housed amongst nuns. For the next nine years their specific location is unknown, but they were probably attached to court, and Henry VI is recorded as having taken great care that they should be brought up as pious and God-fearing men. Henry VI has had a reputation for piety and chastity – indeed, it took seven years for his wife to conceive – probably because of Henry’s lack of enthusiasm for performing his marital duties. Henry VI’s early biographer, John Blacman, claimed that he was equally keen to ensure his half-brothers were chaste – perhaps this explains why Jasper’s name was never linked with that of any woman before he married in his early fifties. Later stories of two illegitimate daughters are not reflected in contemporary records. In 1453 Jasper was granted the earldom of Pembroke, the chief lands of which were in the far west of Wales, surrounding the enormous Pembroke Castle (3). Pembroke Castle, situated overlooking the estuary of the River Cleddau, is a Norman castle. The first construction was begun in the 1090s by Arnulf de Montgomery, one of the barons of William the Conqueror. The early Normans had little interest in attempting to conquer upland Wales, but they were eager to take control of the southern and south-western coasts, in order to give them passage to Ireland. The castle was extensively strengthened and increased in size by William Marshall (c. 1147 – 1219), first Earl of Pembroke. Jasper, too, spent time and money on enhancing Pembroke. Its location in the centre of the south-west peninsula of Wales makes it ideal for protecting both the River Cleddau, with its deep and sheltered natural harbour and the Bristol Channel. It was to Pembroke Castle that Jasper’s sister-in-law, Lady Margaret Beaufort, Countess of Richmond, retired, aged only thirteen, to have her baby, following the deaths of Jasper’s brother, Edmund. Pembroke Castle today is largely preserved and is open to the public. As well as the extensive lands he was granted, Jasper’s closeness to the King and Queen was probably the reason for another mark of favour - he was granted a tower in the Palace of Westminster (4) for life, as a place to hold his Councils and store his documents. 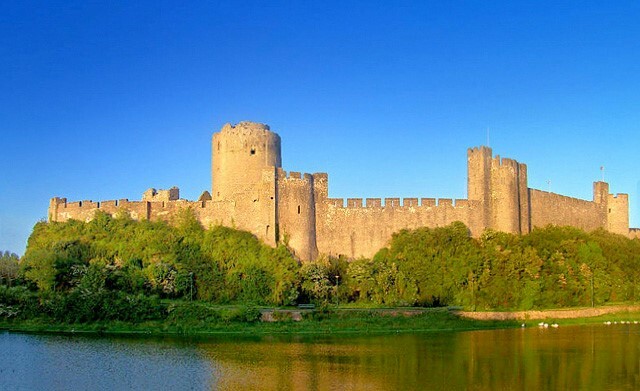 Pembroke Castle wasn’t Jasper’s only building project in the late 1450s. He entered into an agreement with the burgesses and town of Tenby (5), one of the other towns in his control as Earl of Pembroke. The town was to pay for half of the fortification of the town and improvements to its walls, whilst Jasper funded the other half. The walls were to be at least 6 foot wide, to give a sufficient platform for defenders. Jasper then made over ownership of the walls to the town. Significant proportions of the town walls of Tenby are still visible today, and it is also worth visiting the Tudor Merchant’s house, dating from 15 th century, in the hands of the National Trust. There has been some speculation over whether Jasper received the ordinary military training of a man of the English nobility. Whether or not he did receive formal training, he certainly seems to have understood military strategy and to have been an effective commander. In early 1460, Henry VI’s government appointed Jasper as Constable for life of Denbigh Castle (6). Denbigh, the enormous ruins of which are still visible, is one of the castles constructed by Edward I, following his annexation of Wales in the 1280s. Edward also created a Marcher Lordship, centred on Denbigh. The Marcher Lordships were jurisdictionally different from lands in England proper. In effect the Marcher Lords were petty kings – owing allegiance to the English crown, but having jurisdictional rights within the Lordship. The earldom of Pembroke was also a one of them. The Lordship of Denbigh had been inherited by Richard, Duke of York, as part of his Mortimer inheritance, and therefore the castle was garrisoned by his men. As York had been sent to Ireland as Lord Lieutenant with the objective of keeping him out of the country for as long as possible, the government wanted to prevent an easy return, via Denbigh on the North Wales coast. Jasper was therefore required to take control of castle and the town. In order to do this effectively, he needed royal authority. He requested the King to give him permission to raise troops, to pardon any of York’s garrison who submitted to him, and to take the goods and chattels of any of the garrison who resisted, to pay his troops. By May 1460, Jasper had achieved something that no previous commander had achieved – the capture of Denbigh. Even the great Welsh hero, Owain Glyndwr had been unable to besiege it successfully. Unfortunately, Jasper’s efforts proved to have been in vain. York did return to England, and although he was defeated and killed at the Battle of Wakefield, his son, Edward, Earl of March, was determined to prevent Jasper’s forces from meeting with Queen Marguerite’s army. In the first pitched battle where Jasper commanded men, he was unfortunate in facing Edward, who won every battle he fought. Jasper’s force was heavily defeated at Mortimer’s Cross (8), somewhere on the outskirts of Hereford. The exact location of the battle has not been established, although it was on the route of the old London to Aberystwyth road which disappeared in the eighteenth century. The casualties at Mortimer’s Cross were high, and not confined to the battle field – a number of the Lancastrian leaders, including Jasper’s father, Owain, were executed after the battle, in the market square in Hereford. Jasper refused to accept defeat, even after the complete annihilation of Lancastrian forces as the bloody battle of Towton on Palm Sunday, 1461.Jasper himself was not present, instead, he was still in Wales, possibly at Harlech Castle (7). He emerged, together with the Duke of Exeter, in North Wales, where he lost a skirmish with Sir William Herbert at Twt Hill (9), on the outskirts of the coastal town of Caernarfon. It is possible he hoped to attack Caernarfon itself – if he had managed to keep that under Lancastrian control, it would have made a convenient adjunct to Harlech, which was still holding out for Lancaster, and would have allowed troops to be landed on the north west coast of Wales with ease. As it was, Herbert was victorious, and Jasper was obliged to slip away to join the Lancastrian court-in-exile in Scotland. Over the following seven years, Jasper travelled constantly between Scotland, France, Brittany and Burgundy, liaising with the King of France, Queen Marguerite and King Henry. In 1462 he joined the besieged garrison of Bamburgh Castle (10) an enormous Norman keep on the north-east coast of England. The garrison was obliged to surrender on Christmas Eve 1462, with Jasper being granted a safe-conduct to return to Scotland. By 1464, the castle was again in Lancastrian hands, but was defeated in an early use of artillery by Richard Neville, Earl of Warwick.The castle was severely damaged, and what can be seen now is largely the restoration of the 18th and 19th centuries. Bamburgh is in private hands, but is open to the public during March – October. Its location on the Northumbrian coast makes it worth a visit, just to admire the scenery. By 1464, Henry VI was no longer welcome in Scotland, and his forces having been defeated first at Hedgeley Moor, and then at Hexham in April and May respectively, Henry was a fugitive. Jasper continued to travel between France and Wales. 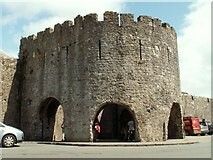 He carried out a swift raid on Denbigh Castle in 1468, burning the town to the ground, before retreating via Harlech. This raid made Edward more determined than ever to capture Harlech, which eventually surrendered, after the longest siege ever conducted in mainland Britain. The famous Welsh song, 'Men of Harlech', commemorates it. 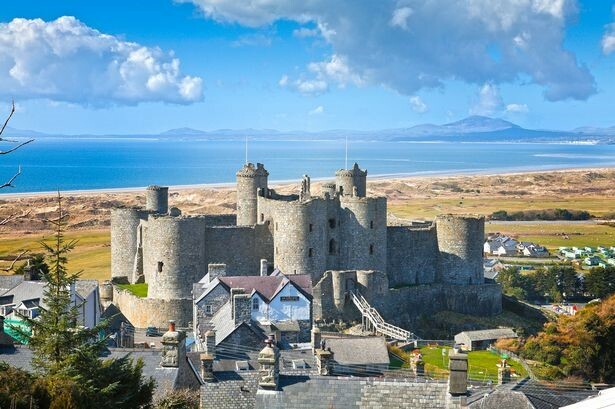 Harlech Castle is one of the most spectacular of Edward I’s castles in Wales. During the fifteenth century, the sea lapped its walls, but changes in the coastline mean it is now well over a mile from the shore. Its commanding position over Ceredigion Bay with a backdrop of Snowdonia make it a beautiful place to visit, despite its bloody and controversial history. 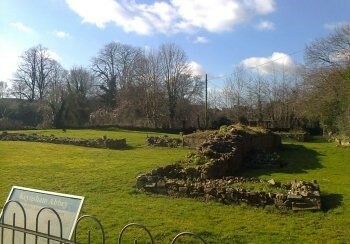 It is in the care of Cadw (the Welsh equivalent of English Heritage or Historic Scotland) and is open all year round. In 1469, the Lancastrians entered England again, this time under the leadership of the Earl of Warwick, who had abandoned his Yorkist allegiance for entirely self-serving reasons, and Jasper, who was named as Joint Lieutenant of the Kingdom. Henry VI was briefly restored, but Edward IV won two crushing victories – first at Barnet, where Warwick was killed, and then at Tewkesbury where the young Edward of Lancaster, and the majority of the Lancastrian leaders were killed. Jasper, who had been recruiting in Wales, heard the news of the loss at Tewkesbury whilst at Chepstow Castle (11). Chepstow is another of the castles built by the Norman Marcher Lords to secure their hold on the South Wales coast and the Severn and Wye valleys. Begun in 1067, it was extended continuously until around 1300. According to its managers, Cadw, it has the oldest wooden doors in Europe – dating from around 1200! It is open to the public. In 1471, there was, of course, no Severn Bridge. Gloucester was the first crossing point, and it was here that the main Lancastrian force had planned to meet Jasper, before being forced to march on to Tewkesbury. They were travelling so quickly that there was no possibility that a message could reach Jasper in time to bring his men to Tewkesbury before the advancing Yorkists could catch up. As soon as Edward realised that Jasper was not among the dead or captured, he sent Sir Roger Vaughan to capture him. Whether Edward remembered that Vaughan had been responsible for the execution of Owain Tudor is unknown – the King was renowned for his ability to remember names in every town he went to, so it is certainly possible that it was a deliberate provocation. But, if it was, it backfired on Vaughan as Jasper, getting wind of his approach, took him before he himself could be arrested. Vaughan was swiftly executed and Jasper, who had his nephew, Henry Tudor, with him, sped towards Pembroke Castle, whence after a brief siege, soon lifted by his allies, he made for Tenby. The good relations he had fostered with the town ten years before now paid off as he and Henry were hidden in the cellars of a Mr White – probably the former mayor – before being spirited away to Brittany. It is alleged that the cellars underneath Boots the Chemist in Tenby is the very location where Jasper and Henry hid. Jasper next set foot on Welsh soil on 7th August, 1485, when, together with his nephew and a small army, he landed at the port of Milford (12), now known as Milford Haven, on the north Pembrokeshire coast. From here, gathering men, they marched through west Wales, crossed into England at Shrewsbury and met Richard III on the battlefield at Bosworth (13) in Leicestershire. Bosworth, surprisingly, is not a well-documented battle, and there have been numerous theories as to exactly where the fighting took place. Today, there is an extensive interpretation centre, and research continues. Once Henry Tudor was successfully established as King, Jasper received extensive rewards, including the dukedom of Bedford, his old earldom of Pembroke, and a rich wife, Katherine Woodville, Dowager Duchess of Buckingham.Whilst he was called upon to serve the King in government, and at the Battle of Stoke in 1487, and Henry’s invasion of France in 1492, he settled himself largely at Sudeley Castle, Gloucestershire, and Thornbury Castle (14), also in Gloucestershire, one of Katherine’s dower castles. Thornbury today is a country house hotel, the majority of which was constructed in the years after 1511 by Jasper’s step-son, Edward, 3rd Duke of Buckingham. Jasper chose to be buried in Somerset, in the Abbey of Keynsham (15), a house of Augustinian Canons, dedicated to the Virgin. The Abbey was dissolved in 1539, and, whilst traces of it remain, there is no sign of his tomb, which cost 100 marks. This article is part of a Profile on Jasper Tudor available in paperback and kindle format from Amazon. Listen to our interview with Renaissance English History Podcast on Jasper Tudor here. 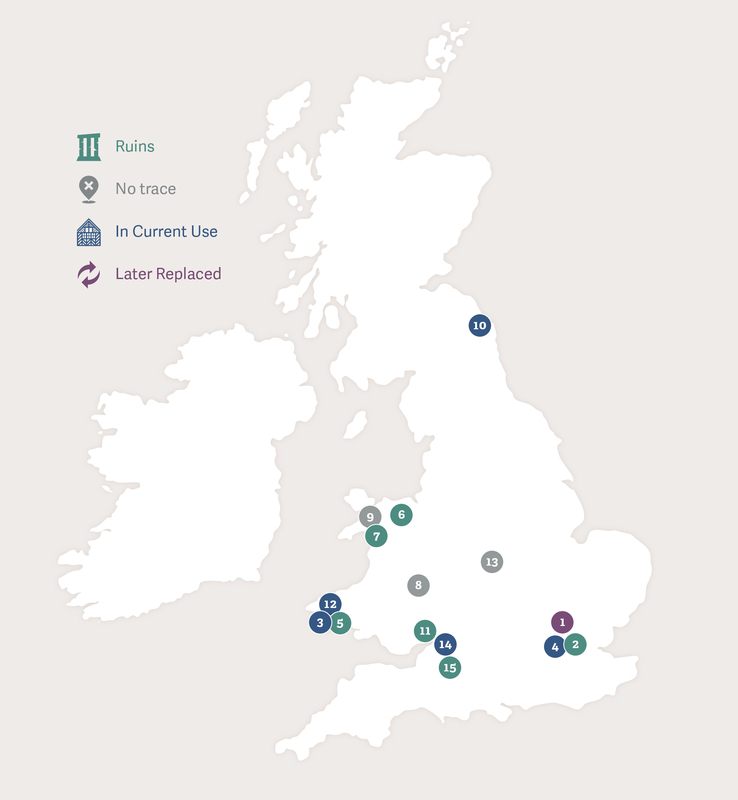 The map below shows the location of the places associated with Jasper Tudor discussed in this article.